If you and your family are traveling to the Salt Lake City area and you’re looking for local attractions, a great place to start is by visiting Antelope Island State Park and the Great Salt Lake. Our team at Affordable Rent-A-Car and Sales urges you to spend the day exploring the Great Salt Lake’s outstanding scenery and recreational opportunities in northern Utah. In addition to the amazing views you’ll experience, swimming and sunbathing are popular on the clean, white sand beaches at Antelope Island State Park. As the name suggests, the Great Salt Lake is famous for being saltier than the ocean. At about 12% salt, the water is so buoyant that people can easily float. But don’t worry; freshwater showers are available so you can rinse off after your swim. Sailing, kayaking, and fishing are also popular options to partake in on the lake. Spending time out on a boat in the lake is a great way to see some of the areas that you normally wouldn’t be able to see. The shoreline spans 10,000 miles and can be one of the most rewarding places to paddle in North America. In addition, wildlife is abundant on the island with bison, antelope, deer, bobcats, coyotes, and elk roaming freely. Antelope Island is a state park located a little more than 60 miles northwest of Salt Lake City. The lake area is open every day from 6 a.m. to 10 p.m., but it is closed on several holidays. Expect to pay a $10 entrance fee per vehicle, and there is a campground available if you plan to stay the night. To reach Antelope Island, drive your rental car north on I-15 to Syracuse, then west on U-127, following the signs. A causeway has been built to allow automobile access to the island. 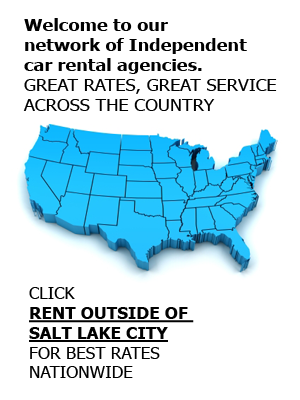 Our team at Affordable Rent-A-Car and Sales can help you find a rental car, van rental, or SUV rental for your time in Salt Lake City. We work hard to give you superior customer service and a dependable car rental that won’t break your vacation budget. Contact us at (801) 266-7368 to make a reservation.